When you need to cut back on your water bill, there are a few obvious places to start. For example, you can turn the water off as you brush your teeth or take shorter showers. But have you ever thought about the way you wash your dishes? 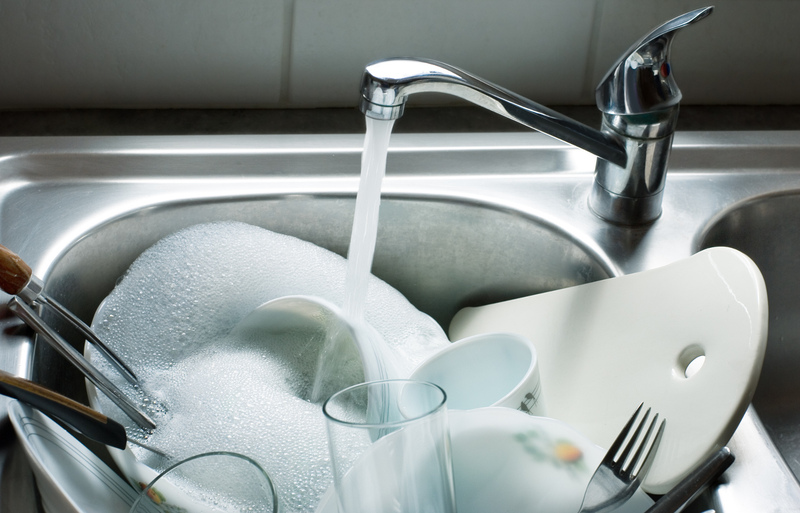 Are you hand washing dishes in your sink, or do you use a dishwasher for the sake of time? Do you have an energy efficient dishwasher? What kind of water you are using when you wash your dishes can also affect how much is used over time. There are many factors that can go into the way you conserve water as you wash your dishes. Let’s do a hand washing dishes vs dishwasher comparison to see which works best. When you are hand washing your dishes and leave the faucet running, it's estimated that you use around 2 gallons of water per minute. If you are more efficient as you hand wash, you may be able to use less water than what a dishwasher would use for the average load. The average load for a dishwasher is typically no more than an eight-piece place setting along with six other serving pieces. With these types of numbers, hand washing your dishes may not be the most cost savvy approach if you are a larger household or have a high-traffic kitchen. If this sounds like your home, you may want to look into getting an energy efficient dishwasher. More and more consumers are becoming concerned about the environment and conservation issues. Fortunately, this means the market for energy efficient appliances has skyrocketed, so it’s easy to find a reliable, affordable energy efficient dishwasher for your home these days. When you look at the compared use of a modern dishwasher to the option of hand washing dishes, it's found that the appliance can use up to one-sixth the amount of water. The use of an efficient dishwasher also uses less energy to operate than the older models. If you are more concerned about not only water conservation but also energy use, it may be best for you to upgrade the appliance in your kitchen. Not only will this help you conserve energy and water use in your home, it will also be a nice upgrade to your kitchen in general. Another tip is to make sure that your dishwasher is loaded to capacity before you run the wash cycle through it. This will make sure you are saving that water usage to your maximum ability. These appliances also run best when filled correctly. With the newer models, it’s not even necessary to pre-rinse your dishes before they are loaded into the dishwasher, again cutting down water usage! There are far more benefits to your home with the use of filtered water than just what it tastes like coming out of the tap. Filtered and softened water reduces the toxins and minerals that are in the water supply. You will have much better results with your dishes as well as all other types of cleaning with filtered, soft water. Using a whole house water filtration system will help reduce the scale buildup inside your appliances, making for even cleaner dishes. Less buildup left on your dishes, countertops, and elsewhere means less re-washing you’ll have to do later. As you look into the best ways to conserve water in your home, take a serious look at how you clean your dishes and just how many dishes you have to clean. If you only need to do a few dishes a day, efficient hand washing should work fine. But if you have a large family or just tend to go through a lot of dishes, a dishwasher will work better, saving you both water and time. For most households, it’s in your best interest to go with an energy efficient dishwasher and the use of filtered water. If you want more information on how to save money on your water bill, check out Advanced Water Solutions' blog here!